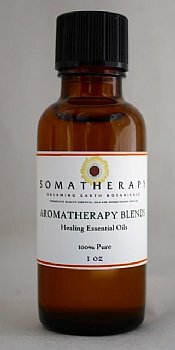 Our Aromatherapy Aphrodisiac for Women is an enchanting, deeply feminine blend of precious and exotic essential oils. A blend of 100% pure essential oils: including Clary Sage, Jasmine, Neroli, Rose Otto, Ho Wood, Sandalwood, Tangerine and Ylang Ylang. This is a deeply feminine blend laced with the exotic, floral aromas of rose, jasmine, neroli and sandalwood. Add this exquisite blend to our Massage Base for a sensual massage (use 1-2 drops per teaspoon or 8-10 drops per ounce), or add a few drops (diluted in a carrier oil) to a warm bath. This is also lovely in one of our aromatherapy diffusers. Review: Fantastic blend! So far this is my favorite.